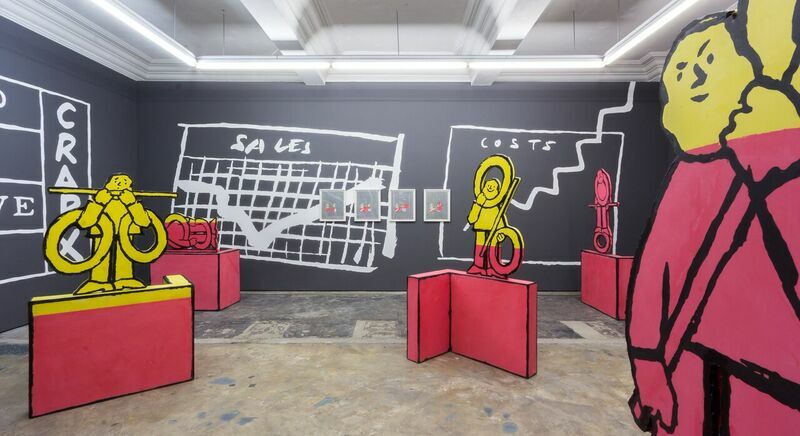 110% is a solo show of works by Mick Peter, a Glasgow based artist who has shown both nationally and internationally, most recently at Gallery Celline in Glasgow and Paris Internationale. It is an exciting edition to a run of shows that has seen Workplace Gallery beginning to use their Gateshead space to exhibit works of artists beyond those represented by them. Occupying the large ground floor room of the gallery, 110% is a masterclass in curatorial editing. Within the space sit five large jesmonite cast sculptures that show a cartoon character created by the artist struggling to piece together a percentage symbol. On the walls are six small paintings of posters featuring the same character, which give the illusion of having been ripped from a wall. They are bookended by five wall paintings of ominous, yet vague, financial forecasts. The title 110% ties in well with the kind of visual language that the artist utilises. The expression ‘to give 110%’ being a ubiquitous yet essentially meaningless statement often used by participants of reality television shows such as business talent show The Apprentice. Peter’s characters, too, have the feeling of imagery that you have seen before, perhaps on a leaflet at the bank reassuring you about your pension prospects. Like the title, you somehow get a sense of what is being alluded to, yet the reality of what they are based on is tenuous. We cannot possibly give 110% as it doesn’t really mean anything. And these are not characters from a bank’s advertising campaign, we have not seen them before, they are the artist’s creation. Yet the brilliance of the work is that you immediately understand the kind of ubiquitous visual language that is being referenced. Content aside, the material qualities of the work are unexpectedly captivating. There is a weird feeling produced when trying to process imagery that seems at first glance computer generated, which on closer inspection has a much more sculptural quality. The black outlines of the characters are gloopier in texture than they appear in photographs of the work. This alternation of photorealistic and cartoonish illustration makes for a body of work that is rich in references and visually absorbing. Peter’s 110% manages the difficult task of communicating his research findings without coming across as dry or preaching to his audience. But the comic nature of the imagery does not allow us to escape the slightly uneasy sensation produced by the exhibition. A sensation similar to that of opening a bank statement after a particularly frivolous month. There may be a lot to look at, but Peter retains focus and clarity through the use of recurring motifs to produce a body of works that engages without spoon-feeding. A difficult task managed with impressive skill. 110%, Workplace, Gateshead, 28 January 2017 – 25 March 2017. Claire Lavender is an artist and writer based in Newcastle upon Tyne. Image: Mick Peter, ‘110%’ (2017). Photo courtesy of Workplace.